World Paper Free Day is an annual campaign that aims to reduce the amount of paper generated by people in their everyday work and personal life. It was launched by the Association for Information and Image Management (AIIM). AIIM is a non-profit organization that provides standards. market research, education, and certification for information professionals. It launched World Paper Free Day in order to raise awareness of huge amount of paper used in vain and to promote paperless technologies. World Paper Free Day used to be celebrated on the fourth Thursday in October, but AIIM has recently moved it to a fixed date, November 6. On this day, businesses and people are encouraged to stop using paper for one day in order to stop being so reliant on paper. According to research, the average office worker uses about four dozens sheets of paper per day, of which about half is considered waste. Despite all modern technology, a lot of businesses still have traditional-based filing systems which require considerable space, equipment and maintenance. 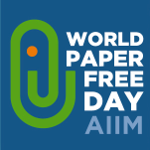 AIIM encourages such businesses to participate in World Paper Free Day to see the benefits of a paperless office. Going paperless helps businesses save space and money, boost productivity and keep information more secure while also making sharing it easier. Besides, paperless offices help the environment: the less paper we use, the less trees are chopped down to make it.